The Element sales office. Contact us for a tour and a chat. If you’re curious or confused about the pre-sale process or about buying a condo in general, you’re not alone. Buying a home can be a confusing endeavour, and throwing condominiums and pre-sales into the mix can only complicate things more. With this post, we're going to explore some common questions buyers often have around pre-sales. 1. WHY PRE-BUY? WHAT ARE THE ADVANTAGES OF BUYING A CONDO ON A PRE-SALE BASIS? There must be some upsides to pre-sales, otherwise no one would do it, right? Of course. Pre-sales are good for us, so we've made them good for you. There are two major advantages: instant equity, and best selection. Pre-sale pricing is notably lower than final market pricing, which is the industry standard. This means that you get instant equity upon project completion. The minute you step into the front door of your completed unit, your home is suddenly worth a lot more than you put into it just a few months prior on a pre-sale. It’s like the opposite of driving a new car off the dealership lot. Finally, there are a few bonus advantages: By entering into a pre-sale agreement, but not being on the hook for a mortgage payment until months later, you have a lot of extra time to save money for a down payment (if you need it) and to arrange mortgage financing. The best selection in mortgages is available to early purchasers. And, if you need to sell your current home, you have a lot of extra time to prepare and get the best price you can. What about location-specific advantages? Why aren’t pre-sales common in new neighbourhoods? The answer to this can be summed up in one word: supply. Saskatoon’s new suburban neighbourhoods are famously overbuilt, with condo buildings sitting partially or even completely empty for months at a time. With so much existing supply to choose from, buyers interested in a suburban condo have no need for pre-sales. Unique projects, completely custom builds, or highly desirable locations where demand outstrips supply are when pre-sales really come into play. No. 1 River Landing is a textbook example of this. 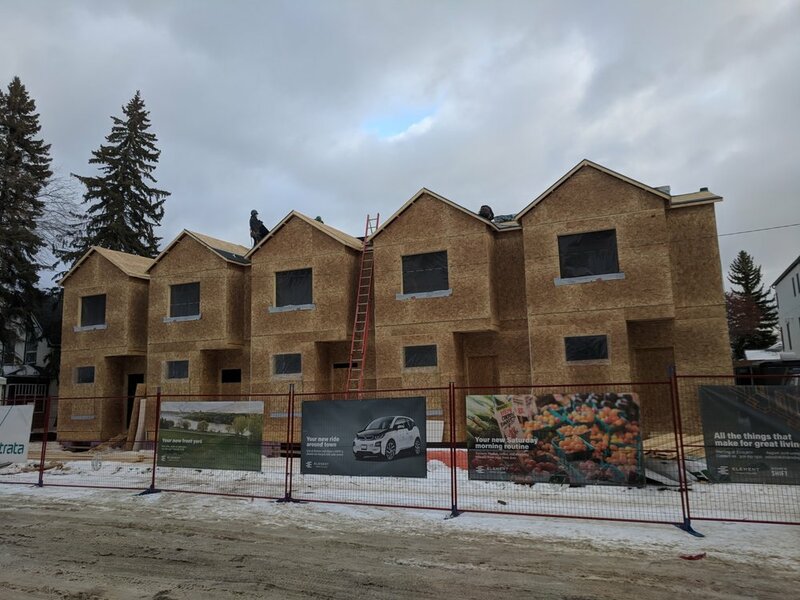 Riversdale also presently has a very limited supply of new housing stock, so if Saskatoon's most exciting neighbourhood is where you want to be, then being an early buyer will ensure you get the best selection. 2. WHAT RISKS ARE ASSOCIATED WITH BUYING A CONDO ON A PRE-SALES BASIS? There’s no denying it: there are obviously some risks associated with pre-sales, but they're far from prohibitive. Let's put all our cards on the table and look at all the possible risks. Secondly, there is the possibility, however slight, that the finishes of your new home don't meet your expectations. Well, you're in luck, because we've already done this once with Element Phase I, and we're more than happy to give you a tour of one of the units. Come have a look at the final finishes and ask Phase I buyers if they met or even exceeded their expectations. Design is one of our passions—we're confident in this one. Finally, there is the risk relating to delivery time of the final product. This is ultimately up to the builder and the faith you put in us. If it helps, every townhouse at Element comes backed by the Progressive New Home Warranty Program, and our general contractor at Phase II, Strata Development, is exceptional at what they do. The project is currently ahead of schedule. Construction progress at Phase II (Streetfront building), as of November 2017. Check out our construction cam page for more! Mishaps happen—but not with Shift. The fact that we’re a smaller local development company, not a large-scale national builder of entire new neighbourhoods, means we can focus much more directly and precisely on our custom-designed homes. We're also heavily invested in the neighbourhood—this is our ninth infill project in Riversdale. Nothing slips through the cracks because we’re laser-focused on a small number of passion projects. And for a final vote of confidence, our CEO actually lives in Element Phase I. How many other developers can say that? 3. WHAT’S UP WITH CONDO FEES? Condominium fees are really nothing more than bundled operational costs. Instead of five separate bills you’re responsible for every month, you have one. Property insurance, water and sewer, and natural gas for heating are all separate expenses for single family homes, but they’re more cost-effective for a condo because of shared services. In addition, condo fees contain the price of escaping the joys of property maintenance: landscaping, snow removal, repairs, and a reserve fund. And finally, there is the access to the electric carshare program (more detail on that below). All of these benefits are rolled into a single, predictable monthly expense you can set in your budget. Additionally, entering into a pre-sale agreement with a limited townhouse condo like Element has the advantage of not increasing before the closing date the way high-rise condo towers often do, because the number of units is physically unable to increase. Townhouses also have lower long-term maintenance costs than high-rise condo towers, which have high costs ranging from window washing to elevator repair. Finally, you may already be familiar with the solar-powered electric carshare program at Element. As an owner, you will have access to a shared electric BMW i3 charged by solar energy. All of the costs related to the car (maintenance, insurance, etc—but not fuel!) is currently estimated at $11 per month per owner, added onto your condo fees. So, for less than a Netflix subscription, you can safely ditch your second car you only use occasionally (and all of its expenses). 4. HOW DO I KNOW IF I CAN AFFORD TO BUY A CONDO? This is where a mortgage broker comes in. A mortgage broker’s job is to find you a bank that will offer you the best mortgage deal you can get based on your determined ability to afford it. There are many great brokers in Saskatoon, but our favourite is Ryan Mollberg. Using the mortgage calculator on his website, let’s do some hypothetical math. At a purchase price of $329,900, a standard down payment of 10%, the maximum amortization period of 25 years, and an interest rate of 2.54% (current Invis 2-year rate), your monthly payments will be $1,335.98. If you’re renting a similarly well-appointed 2-bedroom apartment or townhouse in a core neighbourhood of Saskatoon, your rental payments will probably be similar to this. And you won’t be building any equity or have any say in the design and finishing of your home. Consider your other monthly expenses as well. Bills and payments of all kinds and amounts add up quickly. Some are required, others are discretionary. Some, you may have never even questioned. We’ve already touched on the example of a second car–let’s look at the math on that one using some typical numbers for a hypothetical second family car, a new-ish sedan still being financed. Your car payments are going to be $250-$300 a month (excluding interest), your insurance about $100 per month, fuel will probably run you $50-$100 per month depending on how much you use it, and then there’s the occasional $2,000+ transmission problem that pops up at the most inconvenient times... So, roughly $400 per month at a minimum, assuming no major issues, all for a car that only gets used occasionally? Not a great use of your hard-earned dollars. But it’s still needed, isn’t it? One car for an average Saskatoon household is usually not enough. Compare that $400 you shell out every month for the convenience of a second car you use occasionally to $11 a month for the same convenience. Even if you argue that the convenience provided by a condo carshare program is not quite as good as the convenience of a permanent second car, you can’t argue with those numbers. We’re talking about savings of 97% here. And the Element Electric has the added bonus of not contributing to climate change! Warm fuzzy feelings are provided free of charge. 5. HOW MUCH DO I NEED IN CASH TO SECURE A CONDO ON A PRE-SALE BASIS? This is one area with some flexibility. We’ve worked to keep your deposit low—$5,000 at signing, which will eventually become part of your down payment. You then have 7 days to secure mortgage qualification (most buyers tend to be pre-qualified anyway), and a full 90 days to raise your deposit to 5% of the purchase price. The balance of your down payment is then due at closing date. This drawn out process provides a lot more breathing room than a typical house purchase, which can often feel rushed. Never underestimate the advantage of time. Hopefully this post has helped answer any questions you might have had around pre-sales and condo purchases. There are some serious advantages to it, and we’d be happy to discuss it more if you’re still curious. Give us a call or an email—we love hearing from interested and interesting people!